The International Ocean Discovery Program (IODP) is now accepting applications for scientific participants on Expedition 387 Amazon Margin aboard the JOIDES Resolution. Expedition 387 (based on IODP Proposals 859-Full2 & 859-PRL) will drill the upper portion of the Foz do Amazonas basin of the equatorial margin of Brazil to recover a complete, high-resolution sedimentary sequence spanning nearly the entire Cenozoic. This expedition is the marine complement to the Trans-Amazon Drilling Project transect of continental drill sites, and will address fundamental questions about the Cenozoic climatic evolution of the Amazon region, the origins and evolution of the neotropical rain forest and its incomparable biodiversity, the paleoceanographic history of the western equatorial Atlantic, and the origins of the transcontinental Amazon River. Core and log data from sites on the uppermost continental slope will be used to: (1) generate a continuous record of climate and biodiversity in Cenozoic South America at unprecedented resolution; (2) reconstruct the oceanographic conditions of the western tropical Atlantic; (3) provide critical marine biostratigraphic control for correlation with the Trans-Amazon Drilling Project; (4) determine the onset and history of trans-continental drainage of the proto-Amazon River into the Atlantic; and (5) test major hypotheses about the originations and extinctions of tropical South American biota. U.S.-affiliated scientists interested in participating in this expedition should apply to sail through the U.S. Science Support Program, by visiting http://usoceandiscovery.org/​expeditions. The deadline to apply is March 1, 2019. 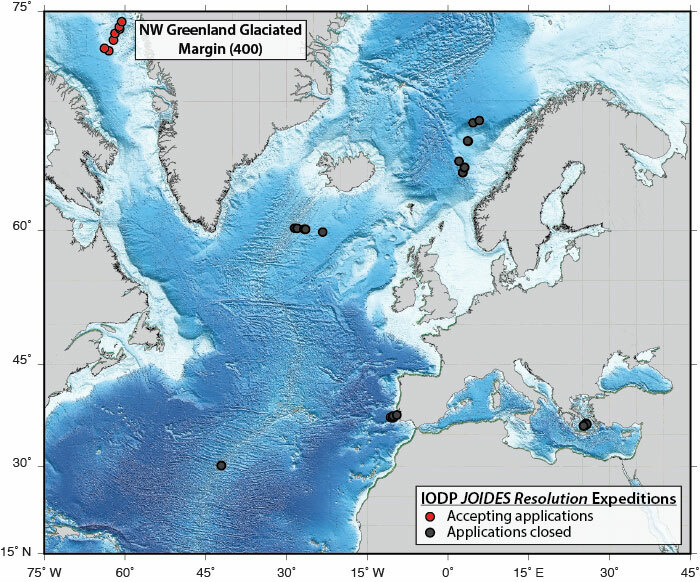 The International Ocean Discovery Program (IODP) is now accepting applications for scientific participants on Expedition 388 Equatorial Atlantic Gateway aboard the JOIDES Resolution. Expedition 388 (based on IODP proposals 864-Full2 & 864-Add) will study the tectonic, climatic, and biotic evolution of the Equatorial Atlantic Gateway (EAG) at three sites on and near the Pernambuco Plateau (northeastern Brazilian continental shelf). These will target Late Cretaceous-Recent sediments and oceanic crust and are strategically located both near the continental margin and at paleo-water depths that are shallow enough (<2000 m) to provide well-preserved organic biomarkers and calcareous microfossils for proxy reconstructions of greenhouse climates. Core and log data will address four key themes: (1) the early rift history of the Equatorial Atlantic; (2) the biogeochemistry of the restricted Equatorial Atlantic; (3) the long-term paleoceanography of the EAG; and, (4) the limits of tropical climates and ecosystems under conditions of extreme warmth. This expedition will constrain the long-term interactions between tectonics, oceanography, ocean biogeochemistry and climate, and the functioning of tropical ecosystems and climate during intervals of extreme warmth. U.S.-affiliated scientists interested in participating in this expedition should apply to sail through the U.S. Science Support Program, by visiting http://usoceandiscovery.org/​expeditions. The deadline to apply is April 1, 2019. Opportunities exist for researchers (including graduate students) in all shipboard specialties—including but not limited to sedimentologists, micropaleontologists, paleomagnetists, inorganic/organic geochemists, petrologists, petrophysicists, microbiologists, and borehole geophysicists. See complete International Ocean Discovery Program expedition maps.